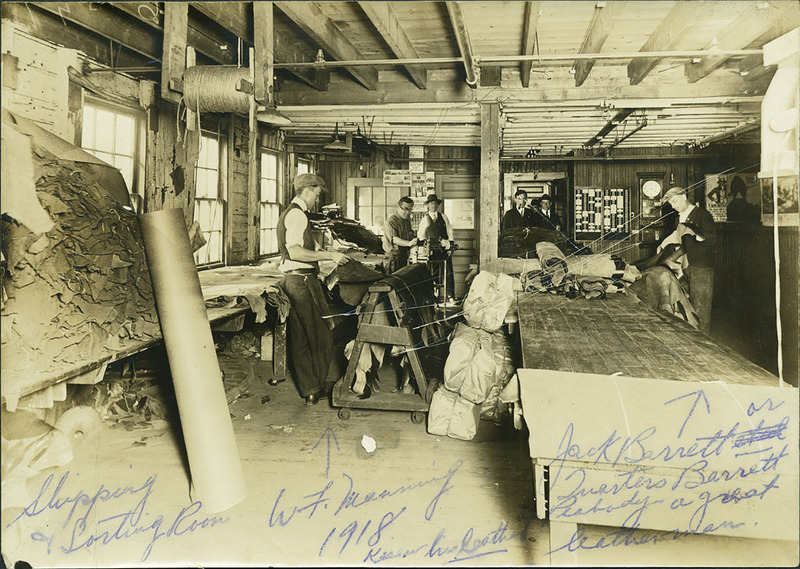 Black and white photograph with ball point pen noting Shipping and Sorting Room at the Boston Mat Leather Company, Peabody, Massachusetts, 1918. Six men are in the photo. On the right is a pen notation, Jack Barrett or Quarters Barrett, Peabody, a great leatherman. Barrett holds a large piece of leather in his hand and is looking at it. At the back of the long table Barrett stands at are two men, both in suits, one with a pipe, the other wears a hat. Beside them, on the other side of a post are two more men, one in vest, shirt, pants and hat and the other with glasses, bent over what appears to be a typewriter and smiling. The man on the right, has his back partially to the camera and is looking at a piece of leather. In the middle of the photo, next to the table are wrapped packages as if ready for shipping. Behind Barrett on the wall are three pictures; one of Uncle Sam, the other of a battle from WWI, the other too faded to see. At the end of the table on the wall appears to be time cards and a clock which reads 11:10. Behind the men on the left hanging on the back wall are signs saying, No Smoking, a calendar turned to Saturday June 3, another sign reading North Shore Babies Hospital and various other ones too faded to read. Another pen notation writes W.F. Manning, 1918 (word illegible) his leather. There are two John Barretts listed in street directory: John F., leather worker, at 83 1/2 Lowell St. and John T., morocco worker, at 46 Endicott street. “Shipping and Sorting Room,” Peabody Institute Library, Peabody, Mass., accessed April 18, 2019, https://digitalheritage.noblenet.org/peabody/items/show/180.